Actidium hysterioides Fries. From Ellis & Ellis (1985). The genus Actidium was established (Fries 1823) to accommodate A. hysterioides Fr., a stellate mytilinidiaceous fungus found on Pinus and Picea in Europe, with two-celled, symmetric, ascospores, light olive to reddish-brown in color, faintly longitudinally striate in age (Barr 1990). Fries (1823) was the first to note its similarity to the genus Glonium in the Hysteriaceae, with hyaline to yellow, slightly asymmetric didymospores (Zogg 1962). Although only one species, A. nitidum (Ellis) Zogg, is known from temperate North America (Barr 1990) from the Cupressaceae, Zogg (1962) recognized an additional three species from Europe, namely A. hysterioides, A.baccarinii (Paoli) Zogg and A. pulchra (Teng) Zogg, all on the Pinaceae. Due to similarities in ascospore morphology, the genus Actidium may have affinities with other didymospored hysteriaceous genera (e.g., Psiloglonium, Actidiographium and Glonium), although molecular data are presently lacking. 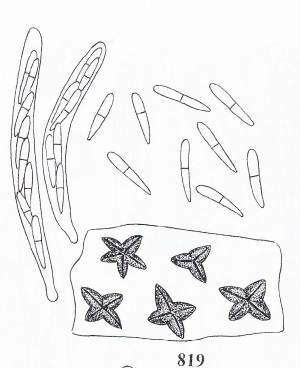 Barr (1990): “Ascomata superficial, gregarious, conchate or triangular or two to four grouped in radiating configuration, small to medium sized; apex cristate, opening by longitudinal slit; base rounded applanate; surface smooth, shining black, longitudinally striate; peridium firm, brittle, narrow, composed of several layers of elongate compressed cells, heavily pigmented externally. Asci cylindric.. Trabeculae sparingly branched & anastomosed, sparse. 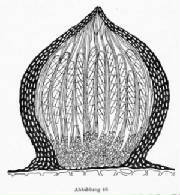 Ascospores light brown, oblong fusoid or straight or inequilateral, one septate median, slightly constricted; walls thin, smooth or delicately longitudinally striate; homogeneous; overlapping uniseriate in the ascus. Anamorphs not known, not formed in culture (Lohman, 1938; Zogg, 1962). On wood & twigs, occasionally leaves of gymnosperms, infrequent. Type species: Actidium hysterioides Fries. Notes: Zogg (1962) included Ostreionella Seaver (in Seaver & Chardon, Sci. Survey Porto Rico & Virgin Islands 8: 77. 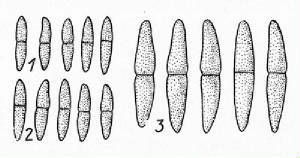 1926) as a synonym of Actidium, but the type specimen of Ostreionella, O. fusispora Seaver has globose ascomata with an abrupt compressed short apical papilla & is instead more closely related to Ostropella in the Melanommataceae. Only one species, Actidium nitidum, is known from temperate North America. This species seems to be closely related to Actidium hysterioides but differs in not forming radiating groups of ascomata, in habit on members of the Cupressaceae rather than of the Pinaceae & in slightly narrower ascospores. 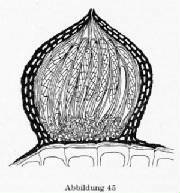 The fine longitudinal striations on walls of ascospores have not been reported previously. Actidium baccarinii (Paoli) Zogg is known from Europe & Actidium pulchra(Teng) Zogg from China. Both of these species have larger ascospores that the other two”. 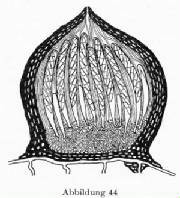 (3) Actidium baccarinii (Paoli) Zogg; Illustration from Zogg (1962). Zogg, Ber. Schweiz. Bot. Ges., 1960, 70, 195-205. Rare. North America & Europe. Collected from the bark & wood of weathered Pinus, Picea & Juniperus. Important synonyms: Glonium nitidum Ellis ex Cooke et Ellis, 1879; Bulliardella nitida (Ellis) Lohman 1938; Psiloglonium nitidum (Ellis) Petrack 1953. Actidium nitidum (Ellis) Zogg. Photo credit: © Alain Gardiennet, France, #AG09080, 18/3/2009, on Juniperus communis. Illustration: Zogg (1962). Fries, Syst. Myc. II, 1823, 596. Rare. Europe. Collected from old wood of Pinus, Picea &Thuja. Actidium baccarinii (Paoli) Zogg. Illustration from Zogg (1962).